What a preamble! I almost threw my hands up in despair as we were told that we had two different ‘classes’ of clue and that some of them led to a ‘thematically reduced’ grid entry. Then there was a poet’s name and an essayist whose family the poet wrote about. We had to use a couplet of his verse to adjust our grid and highlight names that would then appear. Of course, the prompt was there in that word ‘classes’ but I was too numb from reading all of that to jump to the obvious conclusion. Looking back, I realize that the first two lines of that preamble were a work of genius: what a superb explanation of the status quo with ‘…divide (unequally) into two classes. Class I … the (more common) Class II. There’s the hoi polloi putting the plebs where they belong! But that smile came later. Nothing to be done. Take a deep breath and begin solving. A very sober set of clues – not a trace of alcohol, but a few more hints. There’s a ‘Nationalist politician’ (as an afterthought, could that have been Oswald Mosley?) a nanny, quite a lot of profit, gold, silver and capital. It’s the simple clue ‘Gold that we own’ (2) that gives us the way into the crossword. That has to be O[U]R with the U ‘thematically’ removed. A couple more clues like that: ‘More fetching reflecting a bit of stretching’ suggests C[U]TER, and ‘N. African dish informally for salad vegetable’ suggests CO[U]SCO[U]S and we realize that one ‘class of clues’ is going to lead to words with missing Us. Could we be in the world of U and non-U and wasn’t that notion popularised by Nancy Mitford? Now that rather cryptic instruction makes sense: ‘Solvers must follow the thematic features of the Class 1 clues to read the name of an essay that explains the difference between the classes, and its author’. As the other Numpty continues to solve, I rather laboriously attempt to highlight all the ‘u’s in the clues (missing half a dozen on the first read through) then marvelling at Aragon’s brilliance in fitting four into the clue ‘Pursuing horse tire us out: hairy (7)’ (H + TIRE US* = HIRSUTE) and slowly teasing out what followed the thematic features – the subsequent letters – to get ‘The English Aristocracy: Nancy Mitford’. Great: so now we know which are our ‘class II’ clues – the ones with no ‘u’s in them. And it seems that those are the ones that are going to have ‘u’s removed from their solutions too. A brief smile at the words ‘more common’ applied to the rest of us who were not of that self-indulgent pack of pretentious, pampered, toffee-nosed socialites, and we begin to hunt for clues that have two ‘u’s removed from them. Yes, we have B[U]ST[U]PS, A[U]G[U]STA, DISC[U]RS[U]S, D[U]MD[U]M, [U]LM[U]S, NA[U]R[U], [U]S[U]RESSES and CO[U]SCO[U]S. The first letters conveniently (and so cleverly) spell out Betjeman (who else? He was a passionate admirer of one of them wasn’t he and proposed to Pamela twice – why on earth did she choose Mosley!) Much though I loathe the whole shemozzle surrounding the Mitford lot, I have to admire what Aragon is doing with the U and non-U concept. We had already seen JESSICA, UNITY, PAMELA, DEBORAH and DIANA almost appearing in the grid and now that we replace THEIR SINS with I LOVE THEM, three of the names appear. There’s a head scratch before we recognize that there is another ‘for’ in that couplet and that we have D GIRLS in our grid, so, replacing D GIRLS with THE MIT resolves the other two anomalies and gives us JESSICA and UNITY. Of course they were all related to NANCY, the authoress, so she doesn’t need to appear – and we have our fifteen changed letters. This is fabulous compiling. 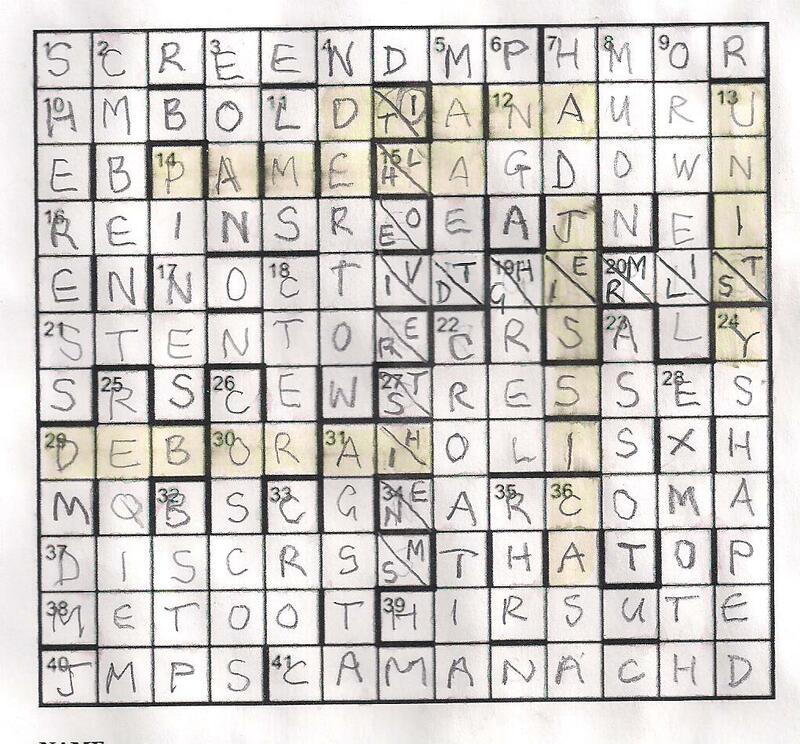 Until I heard that there was a flawed grid printed in the Times, this seemed to be a rather splendid example of a Listener crossword, though we did have one slight doubt. ‘Barney, when Britain‘s evenings are lighter, meeting Penny (4)’ seems to me to be ambiguous. Chambers defines both BUST-UP and DUST-UP as a quarrel or brawl (thus a barney) and DST (just like BST) can be defined by ‘when Britain’s evenings are lighter’. Obviously, the compiler and editors have put that Britain‘s in italics to prompt us towards the BST version but I am willing to bet that a number of solvers will go for the DST option and if they are marked wrong (or if the BST crowd are) I am sure there will be a real barney. Great stuff, anyway. Many thanks, Aragon. This entry was posted on 7 August 2015 at 4:00 pm	and is filed under Solving Blogs. Tagged: Aragon, Betjeman, The Mitford Girls. You can follow any responses to this entry through the RSS 2.0 feed. You can leave a response, or trackback from your own site. It was Diana who married Mosley, not Pamela, but the worst fascist among them was Unity. Google to the rescue – Cavalcade was a play by Noel Coward, Maskelyns probably refers to Maskelyne’s Theatre of Mystery, which was a magic show.